A cupping set is a professional tea taster's and tester's tool. The professional tea taster and tester cup is made up of three-piece white porcelain set. This brew set consist of a brew cup, a lid and a 6-ounce tasting bowl. The set us used to compare teas side-by-side. This is referred to in the industry as 'Cupping." 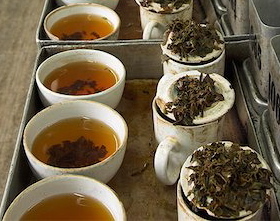 This maintains consistency and standardizes the method of testing and tasting, identifying exclusive individual characteristics and traits of various teas. The cupping set is not just for professionals but novices may also invest in them to cultivate their discernment for tea. Brew cup, tasting bowl, brew cup and lid. Add 2.8 grams (approximately 1 heaping teaspoon for most teas) of leaves into the brew cup. This will allow the tea tasters to touch and feel the leaves. Observing the appearance before brewing. While holding the lid tight, set the cup horizontally on the tasting bowl to decant through the grooved teeth opposite the handle. The tea liqueur is poured in the cup. The infused leaves are taken out to be displayed and inspected before tasting. 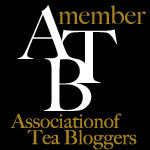 The a tea sample with a teaspoon, sip it and then slurp it or move the liquid over the entire palate of mouth for a smooth consistent taste and to gain a maximum impression of the tea flavor. After tasting each tea, the liquid is spat out into spittoons. In special tastings, a fixed amount of milk is added to the brew to determine how well the tea would taste with milk.